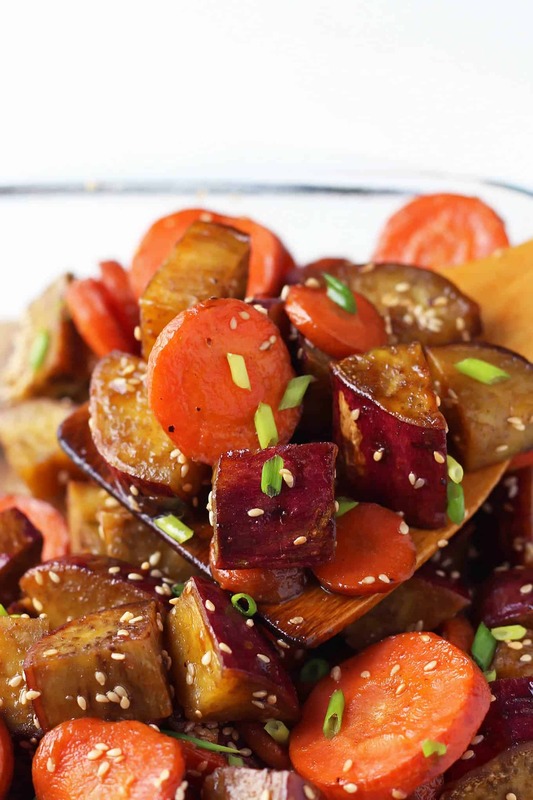 Oven roasted sweet potatoes and carrots with a honey sesame glaze make a delicious healthy vegetable side dish for the holidays (or any time of year really). Holidays are a funny thing when you are far away from family. Especially if the country you are in doesn’t observe that holiday. This year we kind of forgot Canadian Thanksgiving. We didn’t remember until our families back home told us what they had done for their Thanksgiving get together. Oops. I guess we have another chance with American Thanksgiving just around the corner, but I honestly doubt we’ll do anything that remotely resembles a turkey dinner. It’s only the 3 of us after all. However, my sister is planning to visit us for Christmas. So I’ll save my holidays-in-a-foreign-country logistics for that. Not a turkey, but maybe I can manage a roast chicken? At least I know this great place here in Chiang Mai (SP Chicken) that specializes in roasting them. I have no worries about sides or salads though. Side dishes like these Baked Green Beans are somewhat of my specialty. Be it for holiday dinners or a regular weeknight meal. 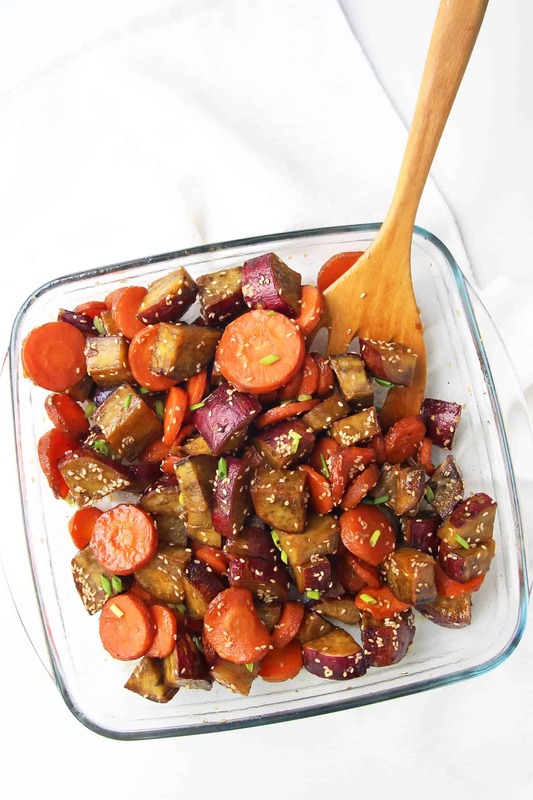 These honey sesame roasted vegetables have been a huge hit in our family. Veggies can be a hit or miss with Konrad, but he kept saying how much he loved these sweet potatoes and carrots. And even Olivia gobbled up her portion in no time, and I had to give her not one but 2(!) refills. The only kind of sweet potatoes I can find here in Chiang Mai are these purple skinned Japanese ones. The skin is really thin and I love the color contrast, so I didn’t peel them. If you are using thick skinned yams instead, you may want to remove the peel though. I am giving you a few options for the honey glaze. While I used regular soy sauce, you can also use Tamari for a gluten-free option, or coconut aminos to make this yummy side dish also paleo-friendly. 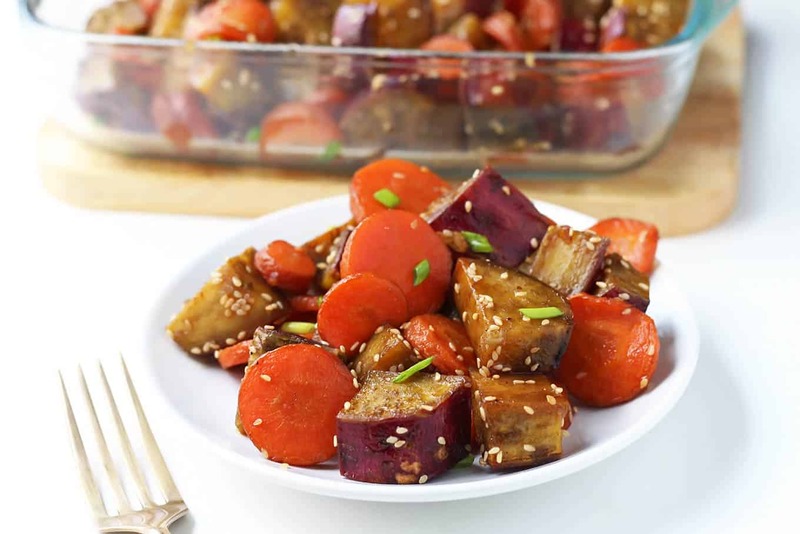 Serve the honey sesame roasted vegetables hot from the oven. And any leftovers make a really great salad topping for lunch the next day. 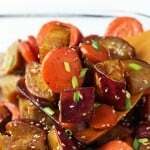 Oven roasted sweet potatoes and carrots with a honey sesame glaze make a delicious healthy vegetable side dish for the holidays or any time of year. Preheat oven to 400 F. Prepare a large baking sheet - I like to line mine with parchment for easier cleanup. 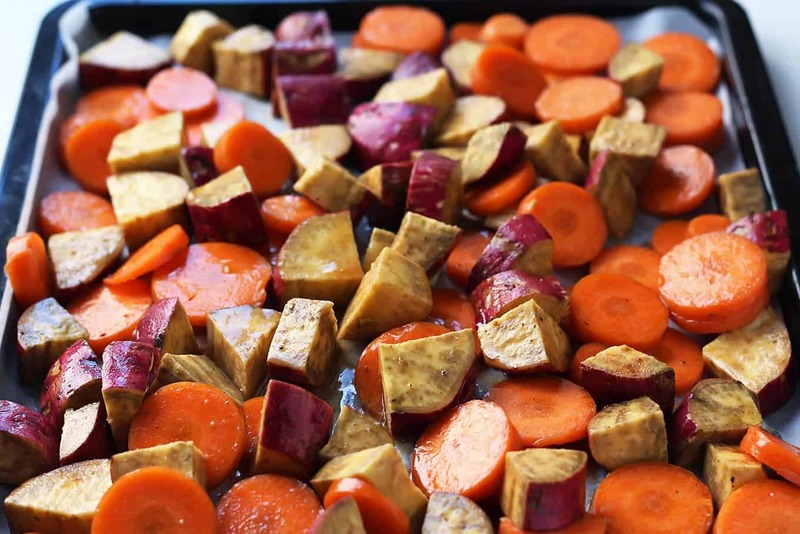 Cut the sweet potato into 1/2 inch cubes and slice the carrot to 1/4 inch thick coins. Season with salt, pepper and a little cinnamon. Toss with 1 tablespoon honey and oil and roast for about 30 minutes. Toss half way through. For charred edges you can turn on the broiler for the last 5 minutes. 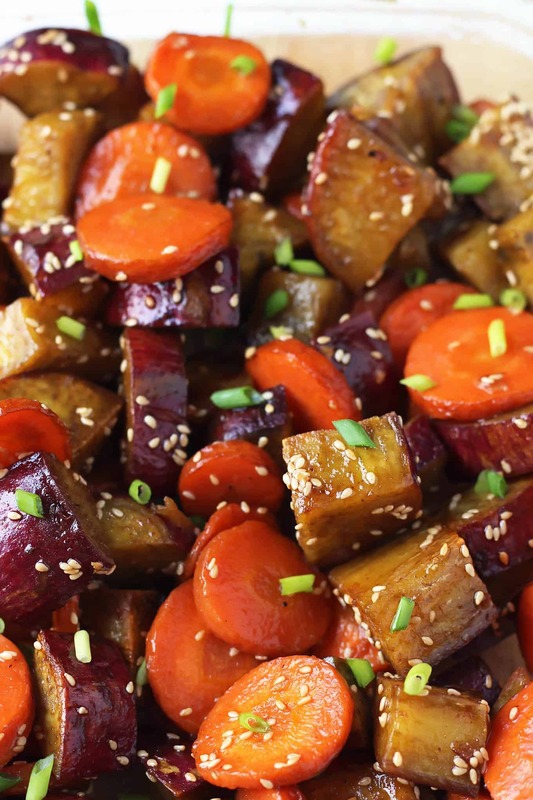 Mix the remaining tablespoon of honey with soy sauce and stir into the roasted vegetables. Sprinkle with sesame and green onion.